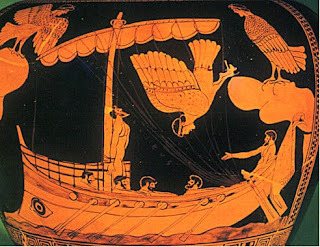 Odysseus | Learn about Greek Mythology,Greek gods,Greek mythology stories! 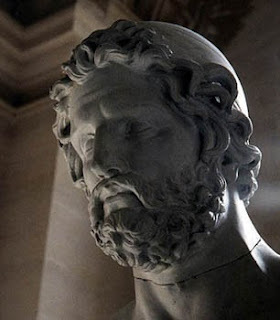 Odysseus,was the legendary king of Ithaca, is the main hero in Homer's epic poem, The Odyssey, and also plays a key role in another epic of Homer, the Iliad. He is widely known for his cunning and ingenuity, famous for the ten years it took him to return to his home after the Trojan War, as allegorical yielded Homer. He was the son of Laertes and Antikleia, husband of Penelope and father of Telemachus. The genealogical tree of Odysseus,was one of the best lieutenants of Agamemnon. His father (or stepfather) of Laertes is Arkesios, son of Cephalus (known founder of Kefalonia), and grandson of Aeolus. In the tragedy "Iphigenia in Aulis" by Euripides the mythical Sisyphus cited as the father, while believed he acquired a son with Circe, the Tilegono. Ithaca was one of the many islands that were included in the kingdom of Odysseus, between the Ionian islands of ancient Greece. His kingdom was apparently a small stronghold in mainland Greece, near the river Achelous. Accurate data of the limits of the kingdom are not known, as the information provided by Homer is unclear. Few is known about childhood and teenage years of Odysseus. From the few references in the Odyssey we learn to hunt the boar home Autolycus, at Mount Parnassos. In this hunt, Odysseus was injured and had a scar above the knee (sign was enough to recognize the maid, Evrykleia when he returned to Ithaca). Elsewhere we learn about his trip to Messina and his encounter with Ifitos, son Eurycles, who gifted him the heavy bow which later killed the suitors. Odysseus was one of the prospective suitors of Helen, daughter of Tyndareus. Tyndareos however, fearing that he would offend the powerful and famous suitors who had gathered, delayed the selection process. Then Odysseus promised to solve the problem, suggested all the suitors to oath to support and help those who chose Helen as her husband. The suitors, including Odysseus, took the oath and thus Helen chose Menelaus, the most powerful of them. There are two versions for the marriage of Odysseus with Penelope. The first version, which describes Homer,shows Odysseus defeating their rivals in a race that had launched Ikarios, father of Penelope. According to the second version, Odysseus for the help he offered to Tyndareus at the wedding of Helen, he got in exchange the daughter of his brother, Ikarios. When Helen was abducted by Paris of Troy (which caused the Trojan War), the suitors were required to honor their oath and help Menelaus to take back Helen. According to Homer, Odysseus knew an oracle that he would return after 20 years, so he did not want to participate in the campaign. To get rid of conscription represented a madman, but the scam was perceived and revealed by Palamedes and Odysseus has devoted himself to the success of the campaign. For others, the brother of Menelaus, Agamemnon, visited Odysseus in Ithaca and after much difficulty persuaded him to join in the Trojan War. With Odysseus now part of the expeditionary, Agamemnon turned to Achilles (which was not suitor of Helen), because it was said that Troy would not fall without him. Odysseus was sent to Skyros at the courtyard of Likomidis to ensure the participation of Achilles. But the mother of Achilles, the goddess Thetis, advised him to dress in women's clothes and hide among the women of the courtyard to not be compelled to participate in the war. Thetis led to this act beacause of prophecy saying that her son will either lived a long and boring life or would die young achieving eternal glory, and feared the consequences if he left for the Trojan War. Odysseus unable to locate Achilles asked, before returning,to be permitted to make gifts to the women of the court. He took some jewelery as well as a sword, a spear and a shield. All women interested in jewelery except one, which caught the interest of the military equipment. Odysseus suspected the fraud and sounded a martial trumpet, upon hearing that,the 'woman' instinctively grabbed the weapons. "She" turned out to have been Achilles and Odysseus so cunning managed to discover it. Then Thetis allowed to Achilles to fight, since firstly gave him the armor of his father, Peleus, which was forged by God Hephaestus himself , to protect him in battle. Shortly before the war started, Odysseus and Menelaus together formed a diplomatic mission to bring back Helen peacefully. And while the arguments of Menelaus was emotionally and unconvincing, Odysseus almost convinced the Trojan senate to return Helen, but ultimately he failed. Odysseus was one of the main Achaean heroes in the Trojan War. The other were the "godlike" Achilles, "lordly" Agamemnon, Menelaus, the wise Nestor, Aias , Telamonios and Diomedes. In the Iliad, Odysseus is presented by Homer as a brave warrior prudent king and a resourceful leader. His view on many issues adopted by other leaders as all of them respected him. Besides the trio Nestor, Odysseus and Idomeneus recognized as the most trusted advisor. During the war, Odysseus becomes a conciliatory and unifying force among the Greeks. Trying to reconcile Achilles with Agamemnon, after the controversy over Briseis, and dissuade Agamemnon when disappointed by military defeats thinks to leave Troy. Still manages to keep the berserk Achilles,who after the death of Patroclus wants to attack the Trojans immediately and unprepared. The bravery and martial skill of Odysseus were praised many times by Homer in the Iliad, but mostly on his nightly campaigns. With Diomedes he managed to sneak in the Troy and steal the palladium, while other time they went to the camp of the Thracians, killed many of them in their sleep and stole the horses of their king. During the funerary games in honor of Patroclus succeeded with the help of Athena,to win the race. Then beat Aias the Telamonios (at funerary games in honor of Achilles) winning the armor of the dead Achilles and causing the suicide of Aias with the sword had given Hector. 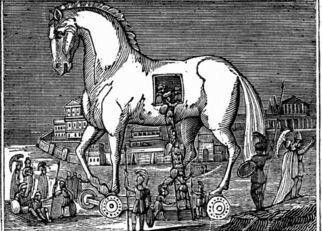 The most catalytic contribution of Odysseus in the Trojan War yet was the inspiration of the Trojan Horse. This wooden construction,a sample of strategic intelligence,was built by Epeio according to the instructions of Odysseus. When completed, Odysseus led inside the Horse dozens Achaeans and waited patiently for the 'triumphant' Trojans. The Trojans, since they believed that the Achaeans left the shores of Troy and left them as a gift the Trojan Horse, led it inside the city and began frantically feasts. With the fall of the night though, the hidden inside the horse Achaeans dashed out and managed to seize the defenseless city relatively easily. This marked the end of the Trojan War. When the city of Troy was captured by the Achaeans after ten years of war, many of the winners made ​​extremities. Killed many civilians, women and children and captured soldiers. Even killed those who sought asylum in the sacred temples of the Gods. The few survivors, mostly women, were transferred to ships for use as slaves after the homecoming of each. At the end of the Iliad refers complete looting, destruction and leveling of the city, did not left standing nor the sacred temples of the gods. After the war ended, Odysseus, like everyone else, he made his way back to Ithaca. For attacks on the Gods but committed to Troy (hubris) he suffered his punishment (nemesis), ten years wandering before he reaches Ithaca. Initially, Odysseus, the gods had not decided on such a big punishment but when Odysseus blinded Polyphemus angered Poseidon, who vowed not to let him never to return to Ithaca. All adventures and wanderings are described in detail in Homer's Odyssey. 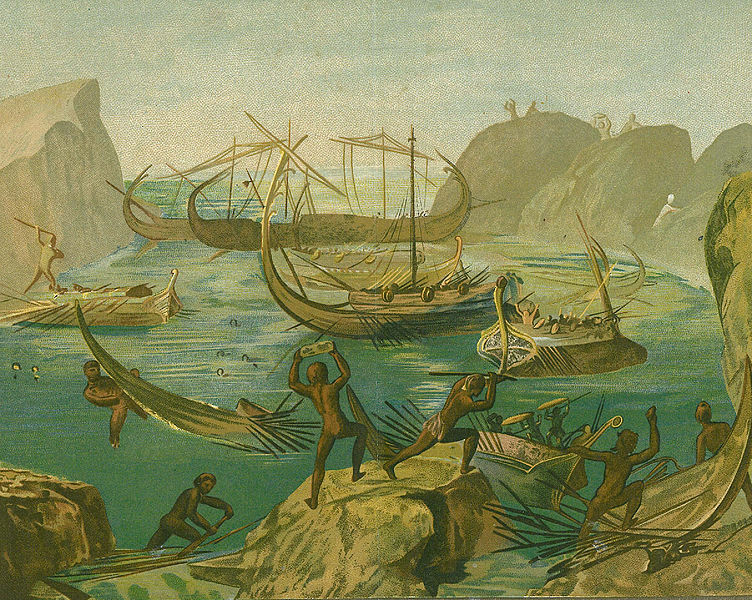 Starting from Troy, Odysseus had at his disposal 12 ships, within which were aboard the Ithacans comrades. The wanderings begin with cruising, and battle in the land of Kikonon, adventure in the land of the Lotus Eaters, and then the land of the Cyclopes, which were trapped in the cave of Polyphemus and Odysseus blinded him, incurring the wrath of Poseidon. Then arrived at the island of Aeolus, where the namesake God gave him a bag containing all the winds except the favorable to immediately return to Ithaca.But while approaching Ithaca, Odysseus' companions open the bag, causing a storm that destroys the 11 ships and drifted the ship of Odysseus to the island of Laestrygonians. From there to the island of Circe, a witch who has transformed many of the crew to animals. A year later, after having descended into Hades to meet Teiresias, leaving the island of Circe, pass through the strait of the Sirens, the strait of Scylla and Charybdis and reach decimated the island of the god of Sun. On the island of the Sun, the remaining companions died while he carried away by the waves,arrives alone in the island of Calypso.He stays for seven years with Calypso,before he made a raft,but after the storm caused by Poseidon he draws to the island of Corfu. There he was found by Nausicaa and finds refuge in the court of King Alcinous, where finally reveals his true identity and moves them all by telling them about his wanderings (where starts the Odyssey). With the help of Alcinous and after new storm Odysseus manages finally, after 10 years, to reach Ithaca. In his way back,initially he had to hide his identity(since he was alone) before finally kill with the help of Telemachus and Eumaeus the 40 suitors, that aristocratic descendants of his kingdom,who believing that he is dead stalked for 10 years the faithful queen Penelope, whose main intention was one of them to get the empty (as they believed) throne of Odysseus. Eventually he killed and the royal concubines who betrayed him all this time.